Kate's Dream (no longer for rent) is an older beach house built on a concrete slab and of cinder block. It's 2 stories and almost 4000 square feet. It is near the end of Alligator Point and what we think is probably the best location on Alligator Point. Kate's Dream was (and still is) one of the pinkest homes you will ever see. 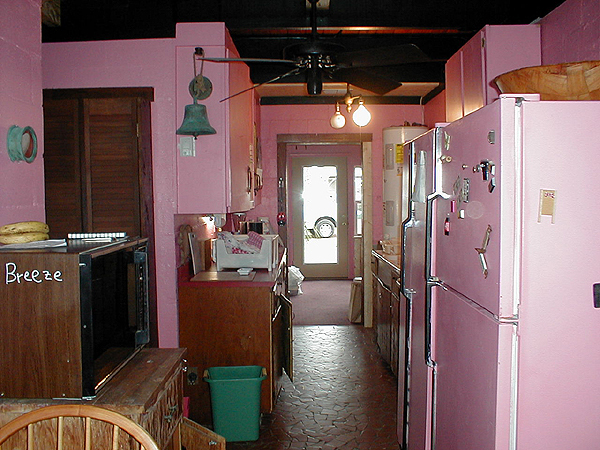 The people we bought it from had painted everything pink; the walls, the furniture, even the refrigerators. We are slowly changing that but you will find lots of pink. The house is not ante-bellum, but parts of it are. You will see some impressive woodwork taken from an old ante-bellum mansion that was being torn down when the house was being built. The woodwork has all been painted pink, and its placement in Kate's Dream is best described as interesting. You will see some antiques, like an old crank telephone, ship's bell, wicker and bamboo furniture. Please be careful with it. This house is at a low elevation and has been flooded several times by Hurricanes; you will see some of the wear and tear of the water. 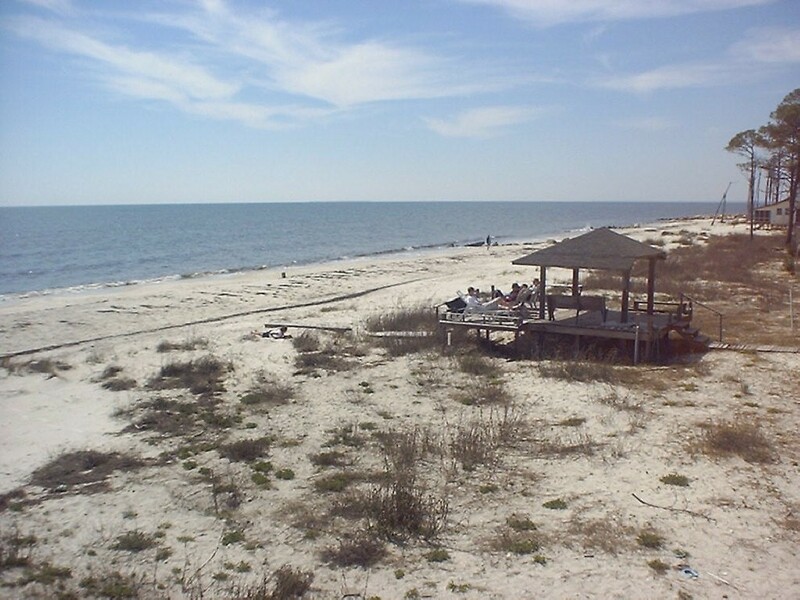 We think being ground level makes it nice because you are living right on the beach. From the front door it is about 100 feet to the water's edge. Actually water is not very far in any direction, the house is on the Gulf, but the bay, Alligator Harbor, is just across the street to the north, less than 500 feet from the house. So the house is both gulf front and bay view and you can see water out almost every window. The house has an interesting history; the previous owners were prominent attorneys and avid active supporters of the Democratic Party in South Georgia. We have been told that many former governors of Georgia, including Jimmy Carter have been in the house. We couldn't verify Jimmy's presence in the house, but when we moved in we did find a custom alarm clock signed by Lester Maddox. Thinking of it as a house once visited by Jimmy Carter is something we like although we'd rather not think about Lester. 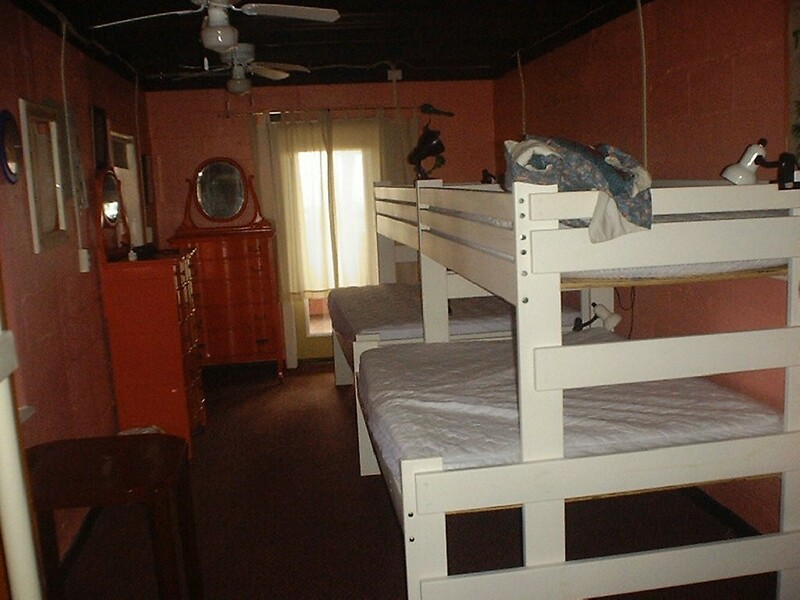 The previous owners are responsible for much of the furnishings and all of the pink color. There are some really nice old wicker pieces, all painted pink, and even an old upright piano, also painted pink. The house has lots and lots of ceiling fans, 18 at last count. Most of these are new and replace the older very nice looking ones that squeaked and shook a lot. The new ones are less elegant, but they are fairly quiet. As we remodel, the house is getting less pink but we will probably never get rid of the pink. It has kind of started to grow on us, and hopefully it will on you as well. Washer and Dryer: We've got em...all you need is the detergent, fabric softener, etc. These are located upstairs in a small upstairs laundry room. The Big Room: For lack of a better name we call the upstairs room "the Big Room" and it is! It is an open room almost 30 feet by 30 feet and it is a large living room. It has several couches and chairs, a few tables, and an out of tune pink piano. Looking into bathroom 2 from outside. Living Room/Dining Room: The furniture includes a dining table for 6 to 8, plus couches and chairs. Again, don't expect fancy! Much of the furniture came with the house and is nice antique wicker, painted pink. This is a nice big room with a TV and VCR. We have a collection of about 50 videos upstairs (a real mix of kids movies, vintage, adventure, etc.). Movies are also available locally. The closest place is the store at the KOA campground a few miles down the road. We do get cable but don't watch it ourselves so we are not sure what's on it, probably just basic cable. Furniture: You will find the furniture an eclectic mix of nice old antique wicker painted pink, not so nice old stuff painted pink and some newer practical PVC stuff (not pink). We are trying to only buy furniture that will not be damaged in a flood, which can be a challenge. The furniture is certainly adequate, but not fancy. Some of it’s unusual, where else will you find a pink piano? The couches are not comfortable enough or built to be slept on, but there are lots of beds in the house. When we purchased the house it was really full of pink furniture, more than we could use so Kate decided to sell some of it to local antique dealers. Rob thought no one in his or her right mind would pay actual money for it, but Kate was right, she probably made $1000 on what Rob was ready to pay someone to haul off. About 6 months later we were in a little antique shop in Carrabelle and recognized one of the pieces Kate sold. It was a “unique” wicker serving table painted pink. The proprietor told us quite a story about how Jimmy Carter’s lawyer had owned a house on Alligator Point, furnished it with antiques, and then painted everything pink. After it sold the new owners were willing to part with some of the most prized pieces including this one. Most of his story was accurate the man who owned the house before us was a lawyer and had done work for Jimmy Carter, and the rest was not too far off. He was asking almost as much for the table as Kate sold a whole truckload for. We acted very interested in the story, but did not buy our table back. Handicap access, we have no special handicap accessible features, but the downstairs is all accessible without any steps, so access to the kitchen, living area, 2 bedrooms, and 2 baths is possible without having to climb a single step. We do rent to some older people who have trouble getting around. The Screened in Porch: This is where we spend a lot of time. 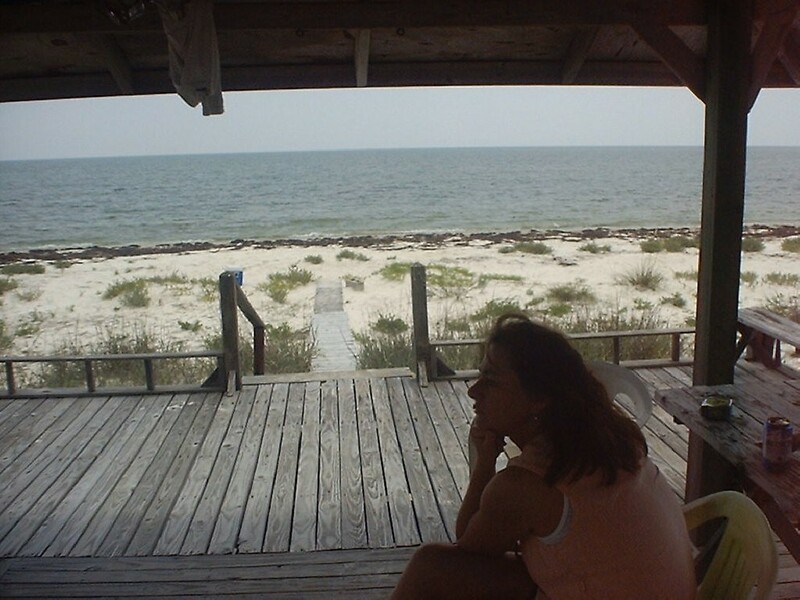 It is a long porch on the Gulf side of the house, about 10 feet wide by 30 feet long, with a great view of the water. It opens into the kitchen, and bedrooms 1 and 2. It has a picnic table with seating for 6 to 8, and several chairs. We eat most of our meals there. 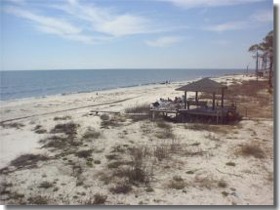 The Deck: This is a new 12 by 16 foot deck located towards the Gulf out an upstairs door. 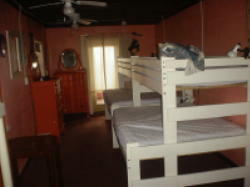 It is at the second floor level and you get onto it from the Big Room. There are stairs leading down to the beach. It is half covered by the roof and half in the sun and a great place to sit and watch the beach. The Gazebo: About half way between the house and the water is a partially covered deck or gazebo that is about 20 feet by 20 feet. It is older and a bit weathered from the last couple of hurricanes, but we like it! There are outdoor chairs and furniture on the gazebo and it is a great place to sit and watch the waves, tend swimming children, or staying out of the direct sun. It has a hose with cool running water where we take about half of our summer showers. A good place for washing off after the beach. The Barbecue: There is a park style fixed grill. It is the same kind as you see in parks and campgrounds. Just a basic box with a grill. You will need to bring charcoal and lighter fluid if you want to use it. If you do please clean it out and please discard your ash on the beach below the high tide line. Don't dump it in the yard or leave it in the barbecue grill, and don't put it in the trash. Alligator Challenge Once there was a millionaire, who collected live alligators. He kept them in the pool in the back of his mansion. The millionaire also had a beautiful daughter who was single. One day he decides to throw a huge party, and during the party he announces, "My dear guests . . . I have a proposition to every man here. I will give one million dollars or my daughter to the man who can swim across this pool full of alligators and emerge alive!"